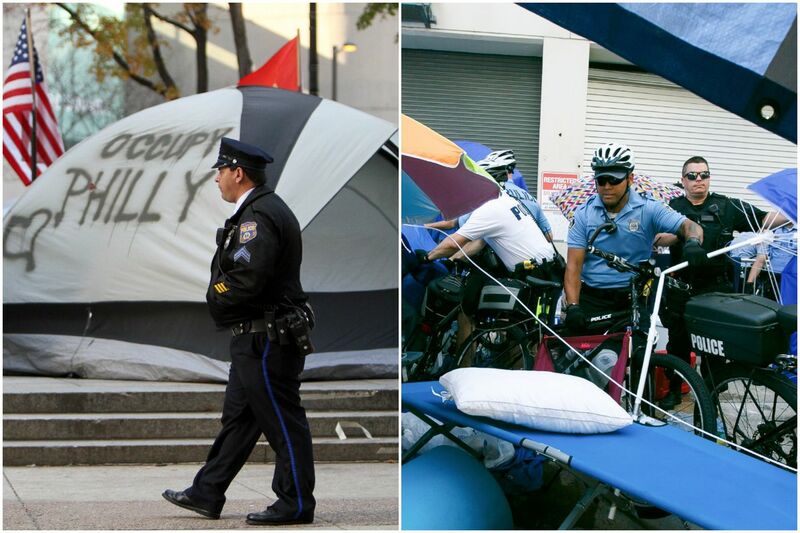 A Philadelphia police officer patrols the Occupy Philly encampment (left) during a 56-day protest at City Hall's Dilworth Plaza in the fall of 2011. Philadelphia Police Officers (left) dismantled a protest at a local Immigration and Customs Enforcement office Thursday after three days. Mayor Kenney is facing a backlash from progressives, a key part of his electoral coalition, after police bike-dozed an encampment of protesters trying to shut down access to a local office of U.S. Immigration and Customs Enforcement this week. The Democratic mayor, who has held plenty of news conferences to decry President Trump's immigration policies, was criticized after officers on Thursday used bikes to push down beach umbrellas and other camp equipment outside an ICE building at Eighth and Cherry Streets. Democratic City Councilwoman Maria Quiñones-Sánchez called the Police Department's response "heavy-handed." Nikil Saval, Democratic leader of the Second Ward, said it almost constituted "a threat to civil liberties, to break up a peaceful protest in the city." Others on the left accused Kenney of being disingenuous, and hinted that they might challenge him when he runs for reelection in 2019. They also expressed frustration that he has not cut off access to a city database that shares arrest and court information with ICE. "Mayor Kenney has said he supports our demands. He has built an entire brand for himself on resisting the Trump administration," said a statement by the Philly Socialists, which helped organize the encampment. "And yet he's the one who is ultimately responsible for sending in hundreds of police to violently disband a peaceful protest." The occupation — and the Police Department's response — put Kenney in a politically awkward position less than a year before the mayoral primary. It pits two parts of the diverse coalition that ushered him into the mayor's office — progressives and police — against each other. The Fraternal Order of Police endorsed Kenney during the 2015 mayoral primary, as did several liberal groups. After officers destroyed the protesters' encampment, Kenney's office released a statement on Thursday saying that he could not "allow individuals to create a threat to public safety by blocking access to a building and setting up permanent encampments." Images of the eviction spread on social media, and activists set up a new camp outside City Hall in hopes of being "face-to-face" with the mayor and City Council members. On Friday afternoon, Kenney held a news conference where he expressed common cause with the activists. "The frustration I have is that I can't abolish ICE. If I could, I would," Kenney said. "I frankly am sad that this situation happened because I actually agree with the protesters and have been working very hard to keep people, immigrants documented and undocumented, safe." He also said that he would make a decision "shortly" on whether to end access to the arrest and court database with ICE. Sánchez said she was "having a really hard time explaining to people in Kensington how anti-ICE people are getting removed doing something morally right" but the Kenney administration gave people in heroin encampments in her district a "30-day notice" to leave. Saval, meanwhile, said, "The demand that was being placed on Kenney was not to end ICE. The demand being placed on Kenney was to end [access to the arrest database] and allow a peaceful protest, and he's done neither." The backlash against Kenney from progressives comes as they are gaining power — and moving left. Former WHYY reporter Elizabeth Fiedler, who was endorsed by Democratic Socialists of America, won a primary for state representative in Kenney's ancestral home base in South Philly. Former staffers and volunteers for Sen. Bernie Sanders' 2016 presidential campaign, including Saval, took control of two wards in the same area. Philly-based writer Malcolm Harris tweeted to the mayor that "if you won't defend our sanctuary city we'll find someone who will. Probably someone younger." Erika Almiron, executive director of the immigrants' rights group Juntos, said the police were "unnecessarily aggressive to people who are protesting on the right side of history." However, she said, she worked with Kenney on legislation supporting immigrants when he was a councilman, and hoped that he would further that cause by cutting off access to the arrest database with ICE. "I firmly do believe that he wants to do right by immigrant families in the city, and I think this is the moment to do more," she said. "We have the potential to be a sanctuary city. Right now, we're nowhere close."